Also known as "Axe of Rage", this game is a sequel to Barbarian: The Ultimate Warrior. The evil wizard Drax is back, and it's up to the player to defeat him again. The game is a mix of beat-em up action and exploration, as the player has to travel through four different stages to finally reach Drax and behead him. 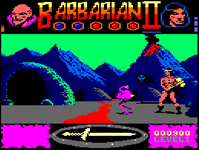 The player can choose between the tall, muscular, axe-wielding barbarian of the first game or an amazon armed with a sword (the princess that was rescued in the original game). Gameplay is similar to the first game, though the many different monsters means the player often need to change fighting styles.